Goodbye February, hello March. And with March come the Mad March Hares. The term Mad March Hare reflects the scatty, testosterone-driven behaviour of the male hare when winter comes to an end. We reckon that we will also see them appear in the financial markets. This year has apocryphally seen Jan and Feb as a particularly hard winter for returns and the start of March for many is seen as a chance to mentally wipe the slate and start again with more gusto. First Mad March Hare is today's craze for quoting statistically sculpted quotes about how the Saudi stock market hasn’t fallen this much in x time since (insert last time it happened). Whilst TMM are as worried as the next person about the consequence of Saudi blowing up, we feel that inciting global panic on the back of stock market movements and two day old dubious stories involving tanks on lorries going to Bahrain is gauche. We would like to put it in some perspective. 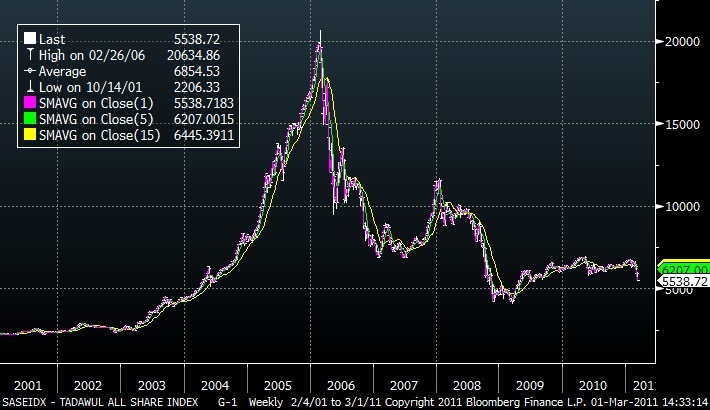 Here is the chart of the Saudi stock market over the past 10 years. These sorts of moves are NOT unusual. Perhaps a market that has been running on Middle East stimulants for the past month is missing a fix in today's otherwise quiet times and is looking down the back of the General's Armchair for something to smoke. As for the Armchair Generals themselves - there is a lot of googling of "Saudi stock market" going on in the background. Short the 5yr UST - After the past month's squeeze higher, it looks as though punters are looking to get ahead of expected strong macro data over the next week or so. Traders are sensitive to pattern recognition, and if the first week or two of February is anything to go by, TMM will not be standing in the way of that one. Readers will recall that TMM are strongly of the view that the Fed will not be raising rates until mid-2012 at the earliest, and will look to buy into the front-end dip after the data dump sometime next week. Long Equities - The first cry of the month is "look at the inflows". Equities have survived a harsh February with Middle East insurrection and an oil shock, but here again, pattern recognition is the name of the game, with punters front-running real money inflows yesterday and expecting a strong day today too. TMM's own Mad March Hare. Selling AUD/NZD .. TMM should have been braver and paid March RBNZ OIS rather than yet again trying to fade the AUDNZD rally, as the former backed up a few bps, while the latter landed them with another small loss. We are sure there are other Mad March Hares out there and look forward to hearing from you if you have spotted any. One last thought - We have all been watching the latest interview that Jeremy Bowen of the BBC conducted with Gaddaffi. Apart from wondering if Mr Bowen was exposed to the same level of flatulence John Simpson was subjected to the last time they got to interview the man, we wonder if an exploding Jeremy Bowen would have been a small price to pay for swiftly ending the Libyan situation and saving many lives? Sell after the POMO but ahead of the ADP number, buy ahead of the 30y auction seems to be a behavioral cycle that has been well compensated. Expect any renewed surge in commodities to be met by re-entry into Long DM:Short EM? Of course, LB's favorite Anons couldn't possibly be wrong about this, not because they present a reasoned argument or verifiable data, but b/c they have a loud voice, attended minor public school (Latymer Upper) and LSE (not bright enough for Oxbridge) and are, by birth and occupation, members of the Social Class That Does Not Like To Have Its Opinion Challenged. Yikes! Someone has some issues they need to work out! "expecting a strong day today too"
They can expect all they want ,but as today showed it buys little in the marketplace. Oil only has to whisper and ole goodbye Mr Bull ofr the session. Up yours, anon(s), you are really easy to wind up. LB has been running intellectual rings around group thinking conformists like you all his life. A review of the ultimate widowmaker - shorting JGBs - might be fantastically instructive. That being said, we don't like Treasuries much for the next week or so. whoa! real personal that explosion abt the social class not accepting another view, the message reflects the poster more than his critic. what wud an educated old fool do if he had a ton of toilet papers, buy more of the same or buy some oil or some gold? "More toilet paper, s'il vous plait!!". That's the right answer, old fool! Is there another pain trade in 2011 developing? Reuters reporting NZ PM John Key said he would welcome RBNZ cut and could not rule out a recession. I have been short TRY/HUF and long ZAR/MXN for some time now. Can't help but think both trades continue to outperform. Don't like trades which involve any exposure to the concepts of "EM" or "Risk" as correlation is broken and not worth getting caught up in painful and non-sensical moves.